In looking through years of photos for this blog, I am constantly drawn to the work I did before I had any real understanding of my chosen medium, in this case, polymer clay. Before all of those inner discussions of practicality, wearability, fine finishing and viability, there was just THE IDEA. Ideas are powerful. They make you feel as if you can create anything you can imagine. 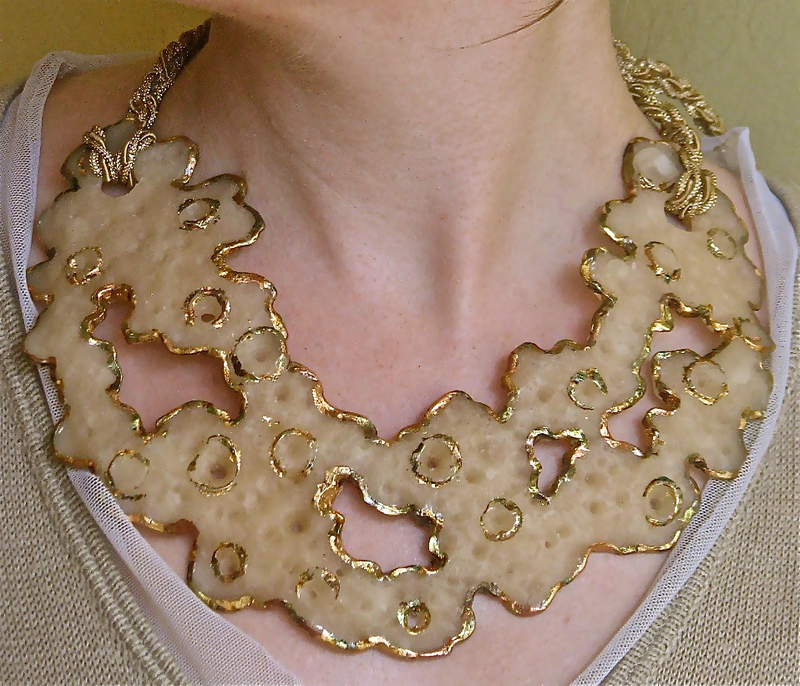 After seeing an image of summer slime mold, I threw myself into making my first large piece, a breast plate. What can I say? Some people are inspired by sunsets, I ‘m driven by the weird gorgeousness of far less lofty things. I was so excited by the process, I felt I couldn’t work fast enough. I had only the vaguest notion about how to make it wearable but I decided to just plow through and worry about silly things like cords and finding later. What I didn’t know about polymer clay at the time could fill a book, so when the piece actually emerged from the oven in tact, I just took it for granted. Ignorance CAN sometimes be bliss. 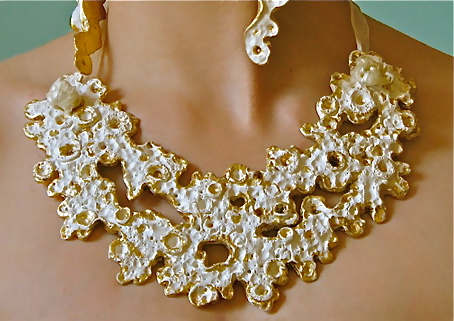 I detailed it with gold leaf , a process I had done many time in my faux finishing days. I found some wired ribbon, stuck it through some openings, tied it in a bow at the back and voila! Slime Mold Breast Plate number 1. Yes, It’s messy. It’s unrefined, it’s lacking in finesse but to me, it’s still a glorious statement of energy, growth and contrast. Themes I still explore today. Buoyed by my first success I tried another go at the Slime Mold design in Premo Translucent. This time my beginners luck failed me. Under baked and probably under conditioned, it broke almost immediately, fortunately I had this one pic to remind me. 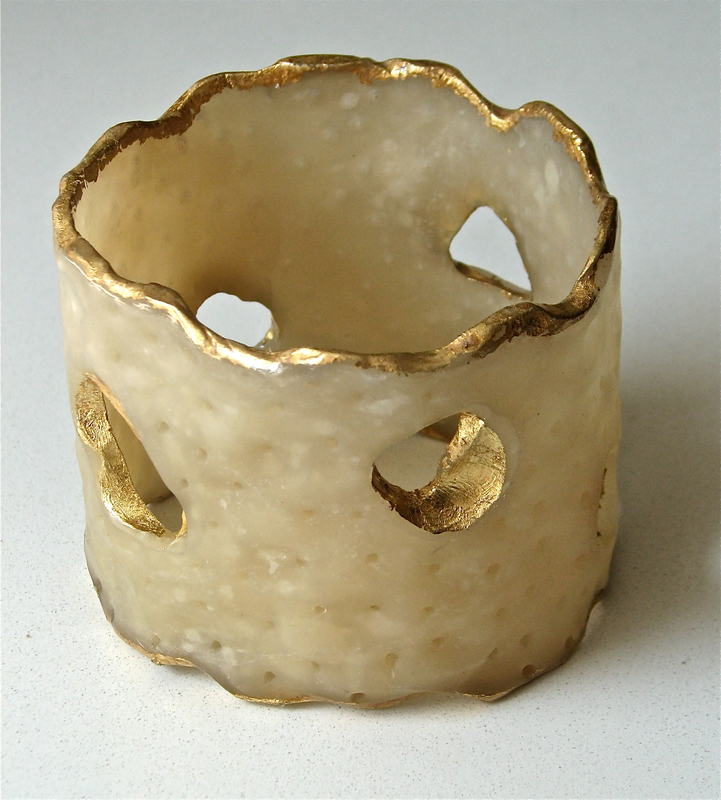 But in the process, a great love affair with Translucent clay had begun. Perhaps I’m drawn to the translucent because it is the most “natural,” least plastic looking of all the polymer clays. I have always felt it looks a lot like beeswax. It also looks like good Cheddar cheese when you first slice it from the block, what’s not to like? Or maybe it is just the perfect vehicle for doing my favorite cut out/network designs like these early polymer pieces. Time and again through various art lives, I have gone back to this ‘network’ imagery. Here you see those cutout shapes in 2 large pastel drawing I did prior to working with clay. The are from my Yoga Series. On the surface of one of my first covered bottles. 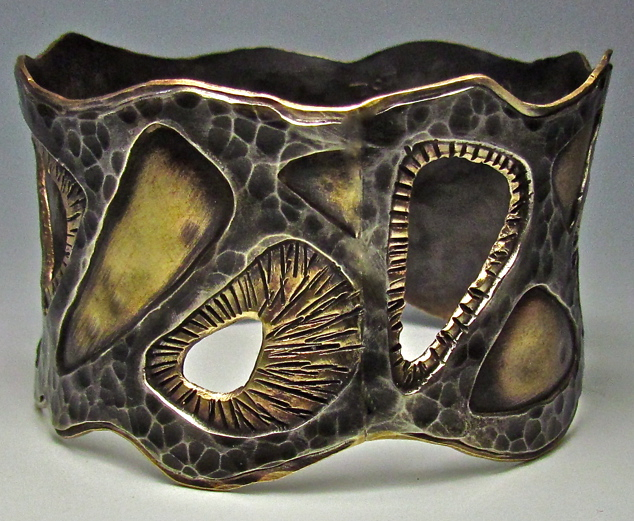 And again, My first metal bangle based on an earlier polymer bangle. I have often wondered what it is about this imagery that draws me, and why I never get tired of it. There is a sort of controlled randomness that I find exciting. It also has that cellular ‘growth’ thing going for it. And yes, I have been known to flirt with numerous other design idioms through out my career. My hope is that those flirtations continue to feed my newer work. Whatever the reasons, I have a feeling there is still more here for me to explore.. With this clay and my networks. 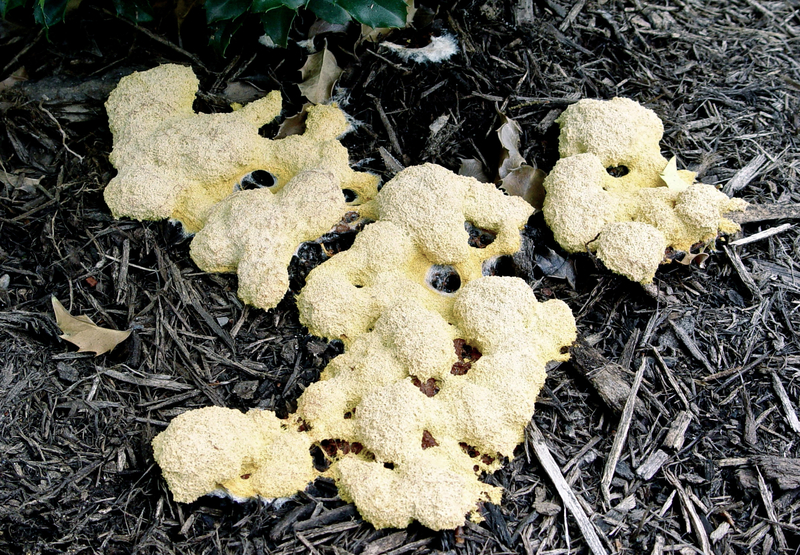 Like my friend the slime mold, I have a lot of area yet to cover and a lot of growing to still do. It’s exciting for me to find so much network inspiration going on in the 3D printing world. Take a look at this site for Nervous System. Maybe In my next life! 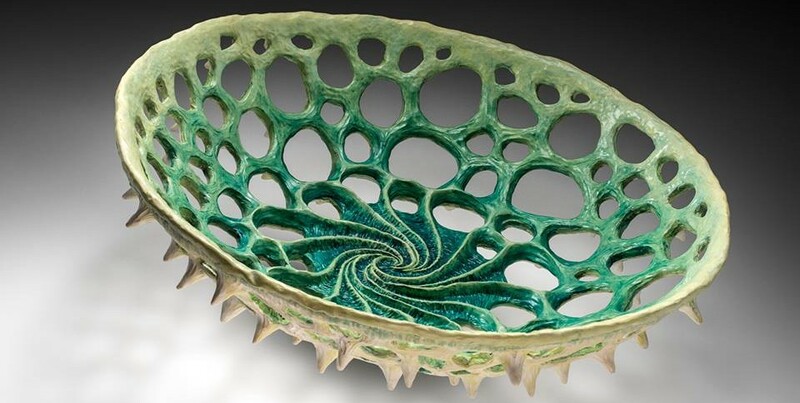 Polymer comes to Pratt Institute.